The “Alfredo” part of the name for this recipe is highly misleading. That’s why I added the “non,” which is not part of the original recipe name. The seasoning mix definitely takes a Creole approach: oregano, thyme, smoked paprika, cayenne, black pepper, sugar, cumin, garlic, and salt. I omitted the salt and sugar. The recipe specifies cutting up a chicken breast into bite-sized pieces, tossing it in the seasoning mixture, and cooking the chicken in a skillet. You then add evaporated milk and tomato paste. Meanwhile you’re cooking the pasta of your choice. 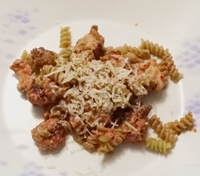 When the pasta is al dente, add it to the chicken mixture and serve. Top with parmesan. I used my new favorite pasta, rotini. It nicely captures the sauce in its nooks and crannies. Rather than buying a whole can of condensed milk, not normally a pantry item in our kitchen, I think a small carton of cream or half-and-half would work well. And I think that next time I’ll grind the oregano and thyme into powder. Overall, though, it was a very tasty dinner. It’s one we’ll do again I believe.